Its a big exciting world out there. So many cool adventures, exciting places and amazing people to meet along the way. Enjoy - Be inspired. Love what you do. Be the best you can be. In March 2012, I headed to Nepal to climb Kyajo Ri (6186m, otherwise known Kyazo Ri) and Cholatse (6440m). 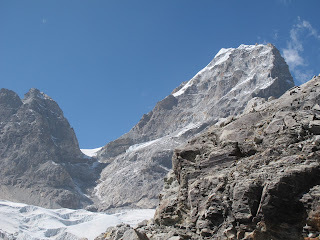 I have tried to write this trip report in a way as to provide information for future parties who wish to attempt these mountains. Enjoy. Be inspired. Life was busy and 2012 was bound to be a busy one but I needed to get back to the mountains. I looked at my calendar and figured I could wrangle a month off around mid-March. Next came the big questions of an objective and teammates for the climb. I decided on Nepal as a destination because of the easy logistics and reasonable airfares, and decided on two 6000m peaks as objectives for the trip. 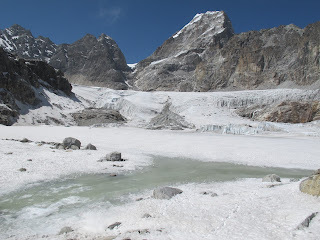 Kyajo Ri (6186m) would be solid ‘warm up’ peak to acclimatise on and Cholatse (6440) would be the second objective. Now all I needed was a solid partner who had the time and was keen for some suffering. On Christmas day, Tim, one of my British mates from Sheffield, sent me an email letting me know he was in. 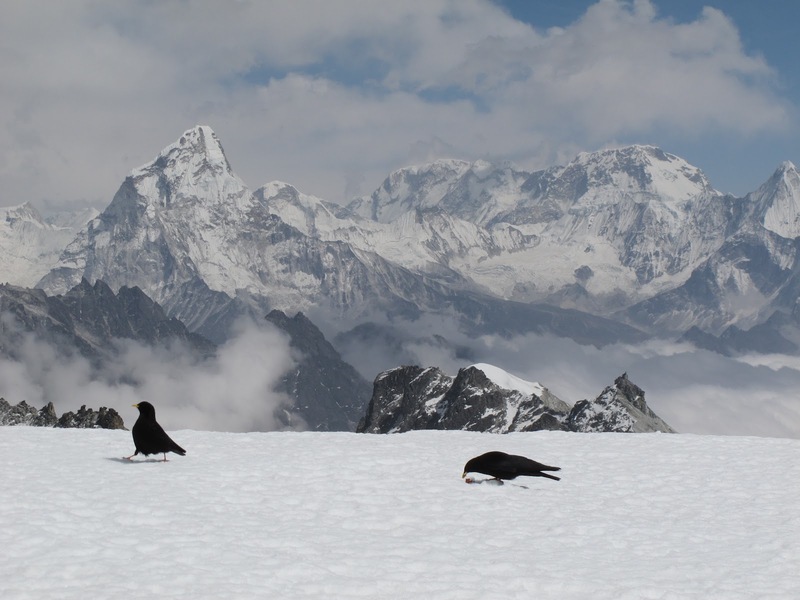 Maybe the five red wines he had drunk that day helped convince him that it was a good idea to leave work and home duties for the simplicity of the Himalayan mountains. It was on. We had an objective, a solid team and a plan. 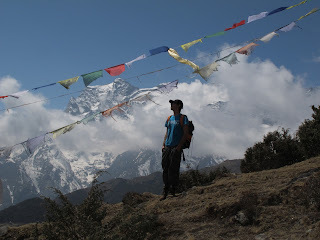 In mid March, I arrived in Kathmandu. It was still a quiet part of the year with not too many tourists around. My trusty agent Nima had helped me arrange flights into the mountains and some strong porters to help us with our equipment. I am quite used to the hustle and bustle of the traffic in Kathmandu but Tim never stopped being transfixed by the near misses and seemingly hectic traffic that resembled some kind of ordered chaos. TimAfter flying into Lukla (2700m), we began the 5-hour trek to Monjo (2700m), the trails still relatively quiet in the middle of March with a hint of winter still in the air. After a few hours of walking the following day we made our way to Namche Bazaar (3400m), the bustling Sherpa village in the heart of the Khumbu. After an active rest day trekking up to Khumjung, we made our way to Thame (3800m) as part of our acclimatisation schedule. 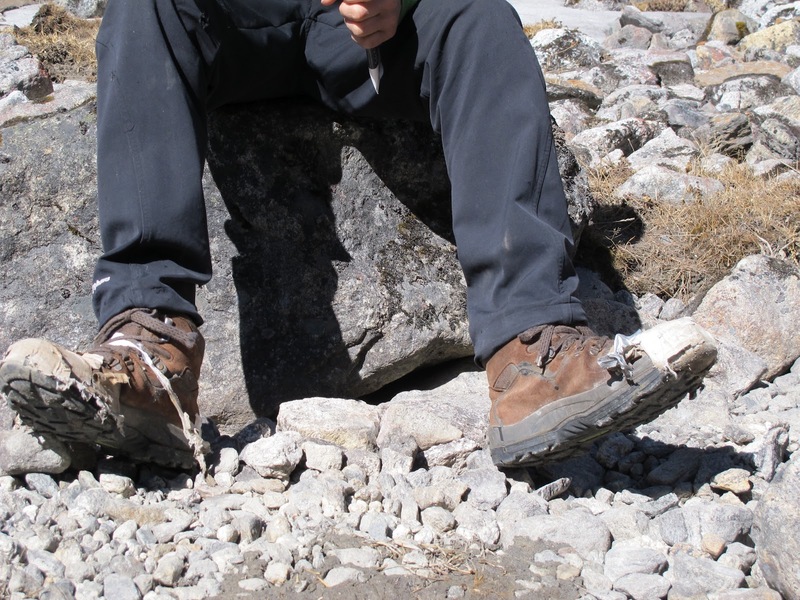 A few hours into our trek to Thame, the soles on Tim’s boots started flapping and peeling off his boots. After some taping repairs, we eventually made it to Thame but the boots were looking decidedly average. We both felt quite strong so we decided to head up to Mende (3700m) and Kyajo Ri Base camp (4500m) the following day. Information on Kyajo Ri was a bit thin and hard to source because not too many expeditions venture into this harder to get to and more recently opened peak. 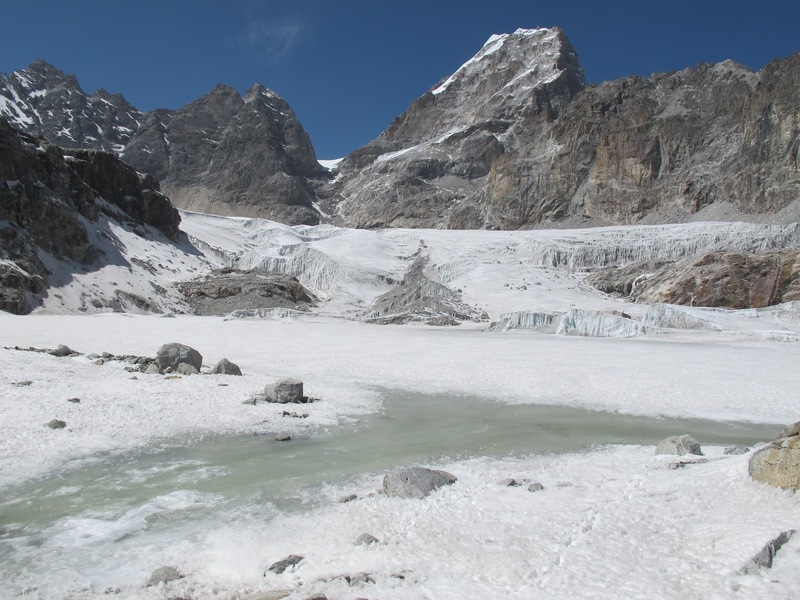 After about two hours walking from Thame, we made it to Mende (3700m) and asked for directions to the Kyajo Ri base camp. Previously obtained information indicated it was only about 2 hours to base camp from Mende, but information from the Mende locals indicated that it was closer to 5- 6 hours so our porters didn’t want to continue that day because they needed to allow time to return to Mende or Namche. 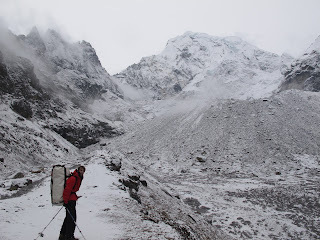 Tim and I were still keen to get to base camp that day so we loaded our packs with the tent and enough food and equipment for the next few days and headed up the steep yak trails past the monastery until some rock cairns led rightwards over a ridge. We continued to follow faint trails as the usual afternoon mist and cloud enveloped us. After around 5 hours, we made it into the Kyajo Dranka; an incredibly beautiful valley flanked by massive peaks, rock walls and frozen waterfalls. 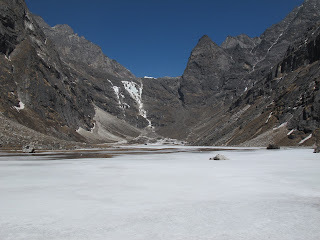 Spring had not arrived in the valley yet and most of the valley floor was covered in snow and ice. 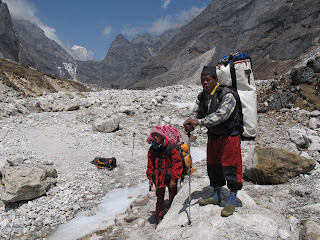 Two of our porters, Prakash and Dan arrived around 9am the next morning after getting an early start from Mende. 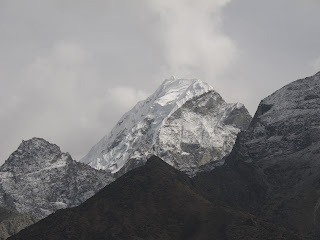 As they left for Namche, we told them to expect us in Namche in about 5 days time. Keen to get started, Tim and I loaded our packs with climbing gear and food and headed up the valley for an acclimatisation carry. The massive rock wall at the head of the first valley was easily ascended via a steep gully on the right side. Once the first rock wall was surmounted, a second long valley and the mountain we intended to climb became visible. 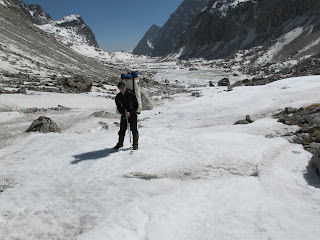 After another night in base camp, we packed and headed up the valley again. 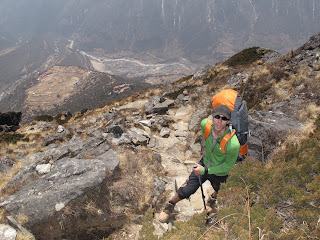 We were barely acclimatised so the going was tough with heavy packs. 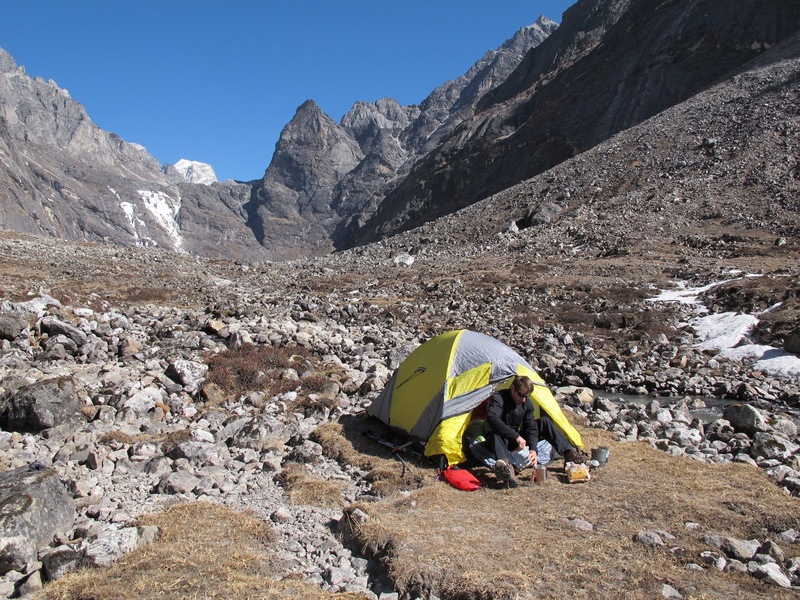 Tim was complaining of some GI disorder and struggling for energy so we made camp 1 at around 5000m in the second valley. It was a beautiful campsite with a little stream nearby for water. 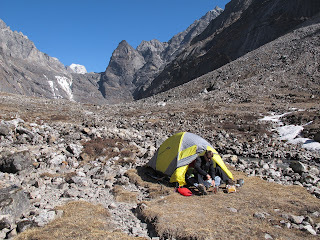 I was feeling strong so I carried some equipment and food to the next camp at 5300m. 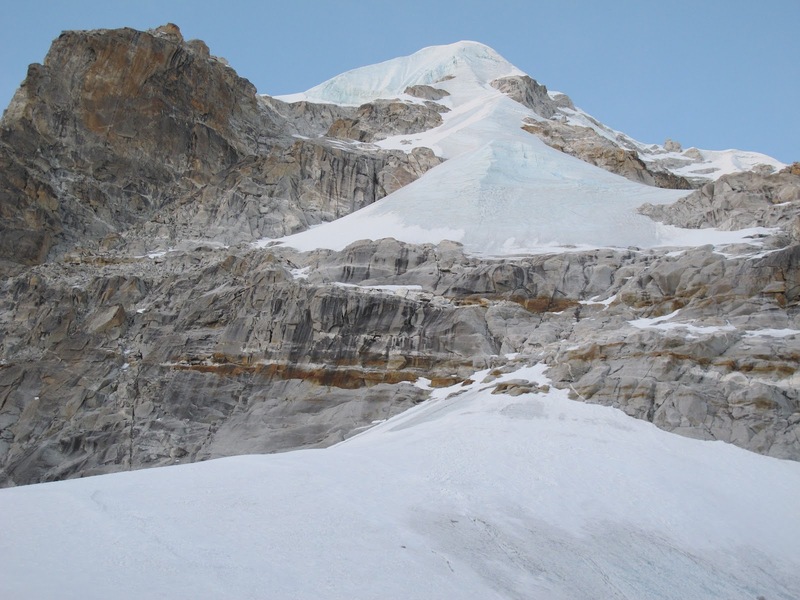 There was some evidence of previous expeditions but it was remarkably clean and pristine. The next day, we made our way to camp 2 (5300m) in a few hours. Tim was still affected by his GI complaint and altitude so a rest day was scheduled in. We tested the effects of altitude on our brain capacity with Sudoku puzzles during the downtime. Tim’s completion of a ‘very hard’ puzzle signalled that he was ready to head up the next day. 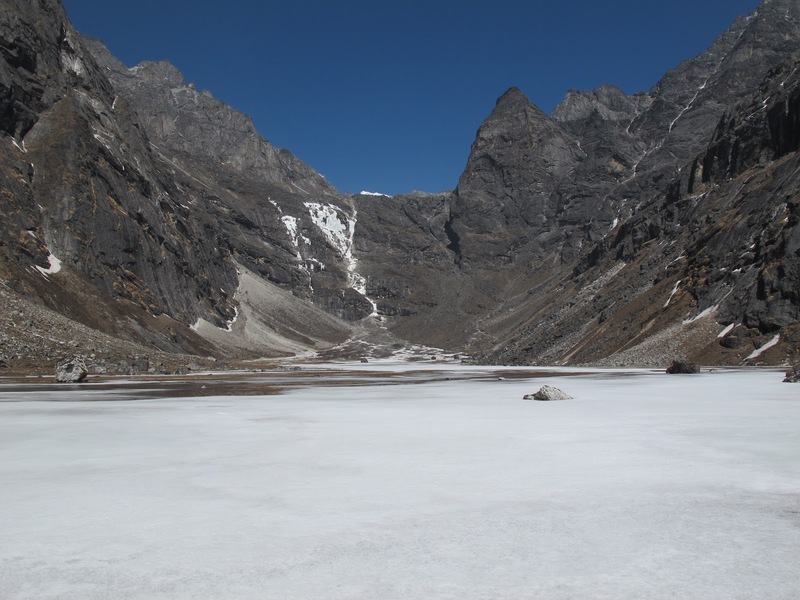 Getting to camp 3 on the col at 5700m entailed crossing a frozen stream and lake, then a relatively straightforward glacier before ascending a steep snow and scree filled gully. After a few hours, we made it to the wind blasted col and set up the tent. With excellent views of the route to the summit and surrounding mountains, we feasted on the last of our cheese, salami and noodles and prepared for the impending summit day. We fed our salami skin scraps to the birds that visited us. Tim was hoping that an illusive yeti might make an appearance and eat some scraps but he disappointed us by not gracing us with his presence. The following morning dawned cold; the wind sucking the warmth from the hands. The first section of the route required some rock climbing that would be agonising and dangerous with cold bare hands so we delayed departure from camp till 8am. 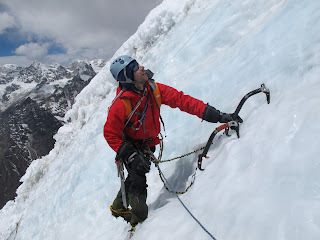 Tim took the lead on the first few rock and ice pitches though perfect granite and bulletproof blue ice. It had been a dry winter and there was very little snow on the mountain. By the end of the day, the calves would be burning from endless front pointing (standing on the front points of our crampons) on the hard ice. After 3 pitches, I took over the lead and we began simul-climbing up 50-70 degree ice toward the summit, placing ice screws as we climbed. 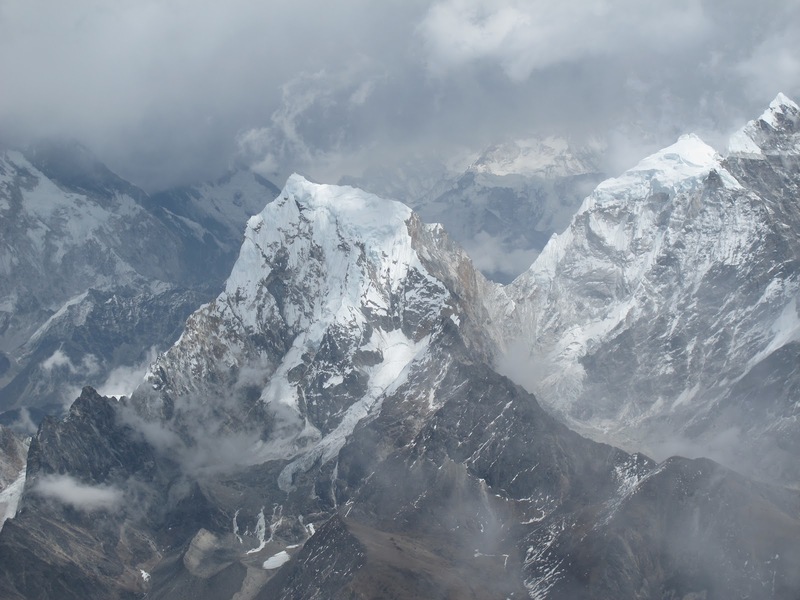 Black clouds were forming over the nearby mountains as we climbed at a steady pace, breathing hard in the thin air. 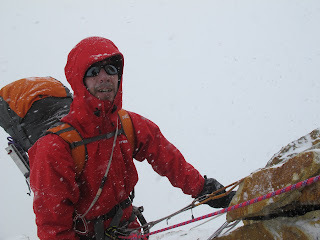 Around 2pm, I stepped onto the summit and set up a belay to bring Tim up. 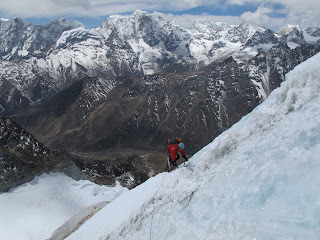 We had amazing views of the south face of Cholatse, our next objective. 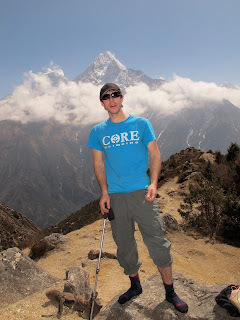 We were supposed to be back in Namche by this time so we were overdue. We had no mobile phone reception so we had no means by which to notify people that we were OK. The bad weather was closing in so after a few minutes on the summit, we began abseiling back to camp 3 using v-threads in the ice and snow stakes. We arrived back at camp tired but still intent on making it down to camp 2 where it was warmer and less windy. 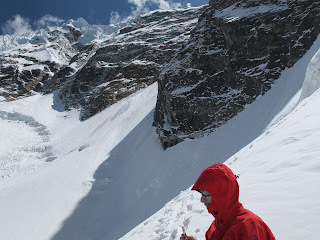 It snowed for most of the afternoon, making the descent seem that little more desperate. Crossing of the frozen lake late in the day was going to be interesting because we didn’t know how thick the ice was. It seemed thick enough early in the morning when we first crossed it but after a few days of thawing, I wasn’t too sure. Tim thought it would be ok so we roped up and I suggested he went first. We were both carrying heavy packs and the thought of falling through the ice into freezing water a long way from help was unimaginable. 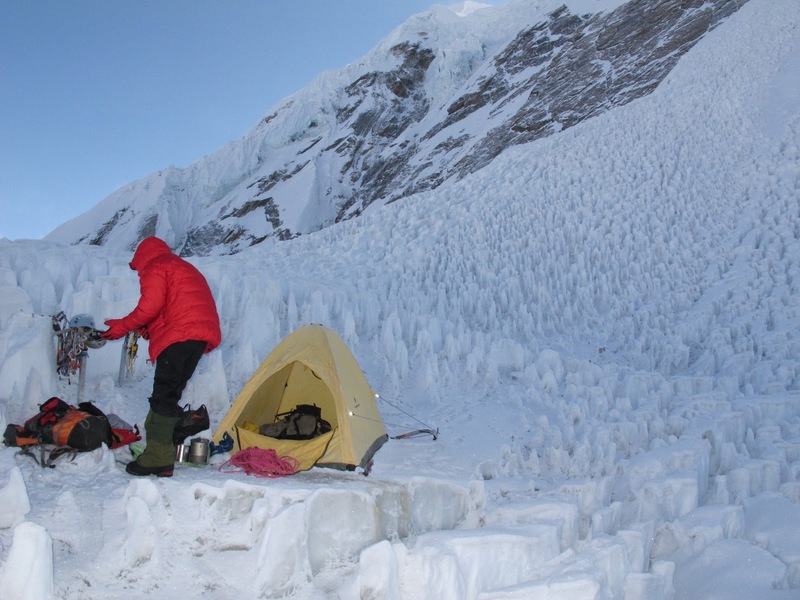 Thankfully, we made it back to camp 2 without incident and settled in for the night. After an 11-hour day, we had one packet of minute noodles and 2 slices of salami. We had so far stretched our 5 days of food to 6 days, but this was the end of it. 10 minutes later, we used the last of our gas making tea. We were too exhausted to care and both crashed into delirious sleep. 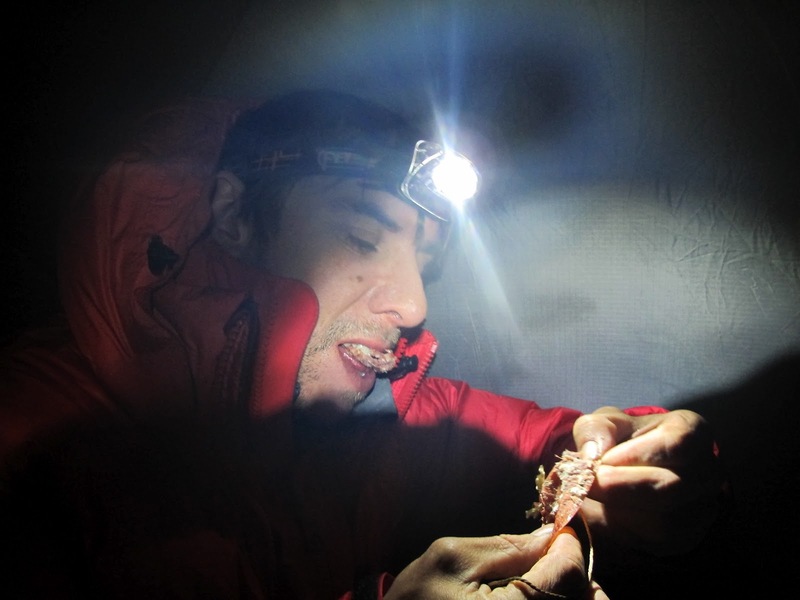 Tim attacking the salami after summit day. 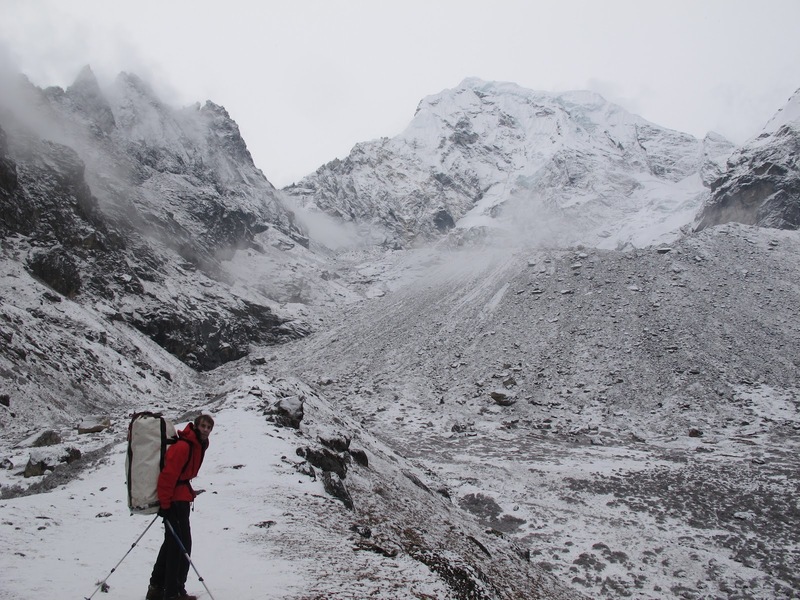 After a slow start and the last of our food- an energy gel each, we packed and headed down toward base camp. 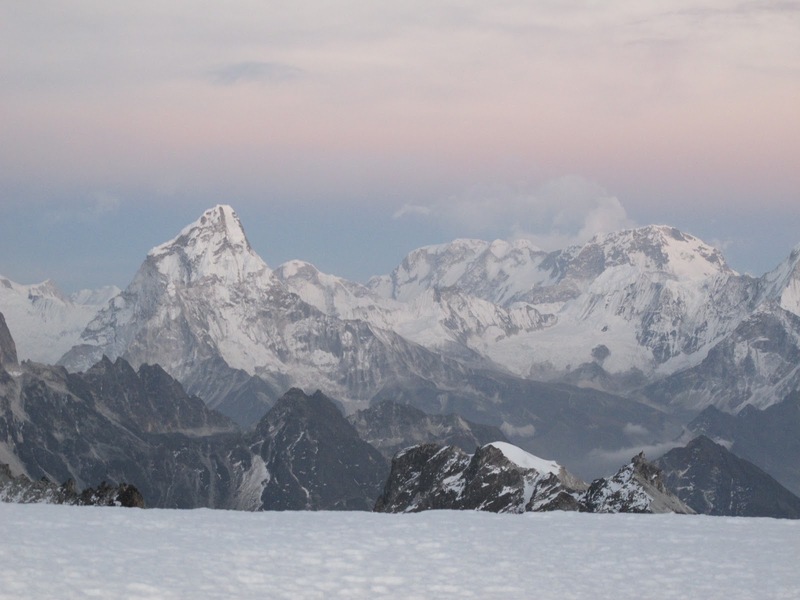 From the ridge above base camp, we saw two people waiting below. Without wanting to get our hopes too high, we waited until we reached them to confirm that it was our fantastic porters, Prakash and Dan. 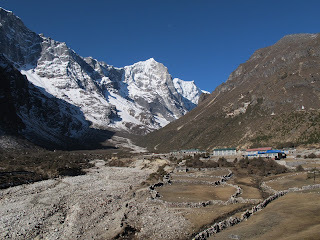 They had walked up from Namche that morning after the lodge owner told them to come and look for us. We were overdue and they were worried. After splitting up the loads, we headed down. We had been told there was a short cut to Namche via Khunde so we tried to follow a trail and water pipe trench leading to a break in the ridge above Khunde. The trail became exposed and unnecessarily dangerous at one point and we were not willing to risk the lives and safety of our porters or ourselves so we headed down through a thick thorny forest toward Thamo instead. Four hours later, we walked back into Namche for a well-earned rest and food. Though sickness, exertion and lack of food, we had both lost a few kilos. Our clothes were now hanging off our frames. 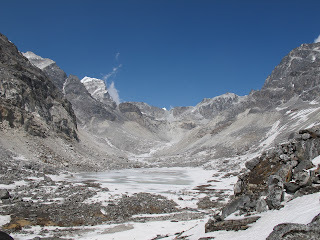 After two days rest and some good food, we headed into up into the Gokyo valley up to Dhole (4200m). 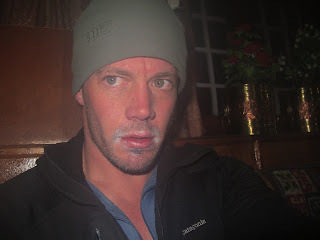 Feeling well acclimatised and rested, we covered the distance in about four hours. Cholatse became visible as we trekked toward the small village of Machermo(4400m) the following day. The mountain looked rocky and relatively bare of snow compared to previous times I had seen the mountain during post monsoon seasons. 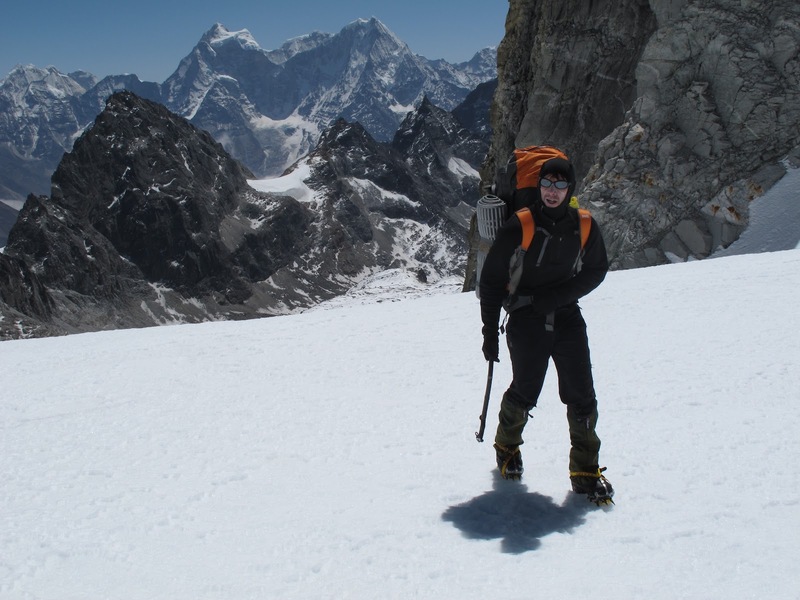 Initially, we had planned to climb the north face of Cholatse, but after Kyajo ri took longer than planned and the scarce snow conditions of the mountains, we decided instead to try the South West ridge. The following day, our porters helped us carry some of our equipment up to the base camp and then headed back to Machermo to wait for us. 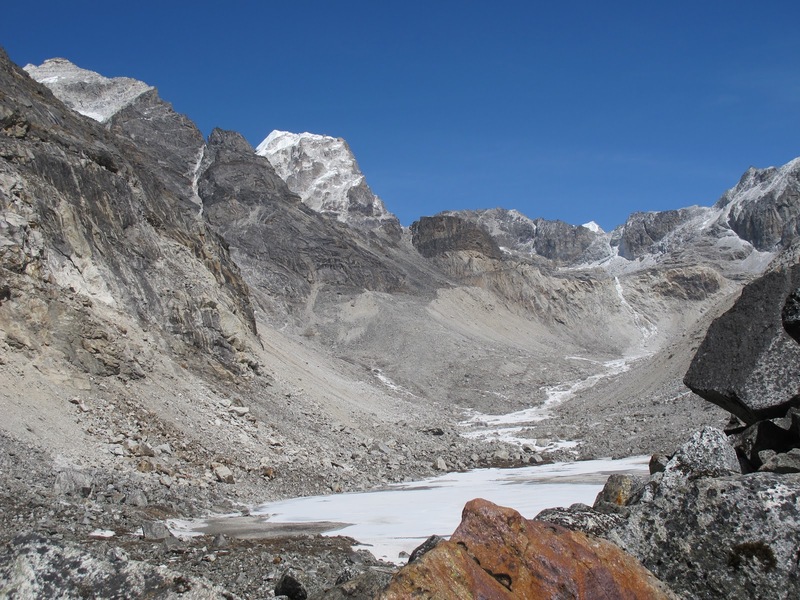 From the base camp, the route followed a little valley from the left side of base camp to a moraine ridge overlooking the Cholatse glacier. 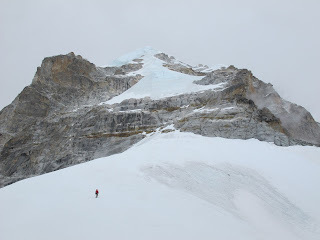 We headed up the right side of the glacier in deep snow conditions, sometimes struggling in waist deep powder snow, and made camp at around 5400m nestled between the seracs on the glacier. We woke with the inside of the tent covered in rime ice from our condensing breath. Every time we moved or brushed the tent the ice crystals covered us and filled our sleeping bags. 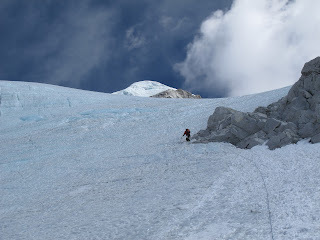 We headed up toward the headwall leading to the col camp 5600m, weaving around some crevasses on the glacier. 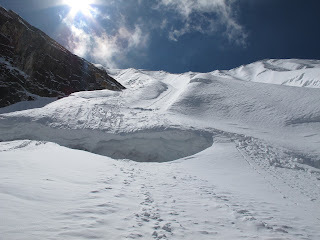 After crossing the bergshrund (crevasse that separates the mountain from the glacier), I encountered deep unconsolidated snow and spent around 10 minutes trying to make progress before retreating momentarily. We tried a few options before Tim tried without his pack on and made it through to some slightly more solid snow and made an anchor. 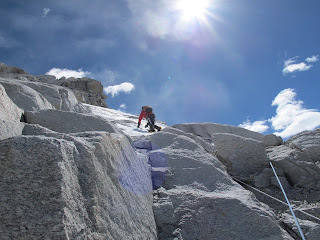 After another hour and some steep snow climbing, we made it to the col, which was in remarkably different condition to the last time I was there in 2006. The smooth even snow had given way to foot high sastrugi (fins of windblown ice) that were extremely awkward to negotiate. Maybe it was the pre monsoon conditions, the dry winter or the effects of global warming. 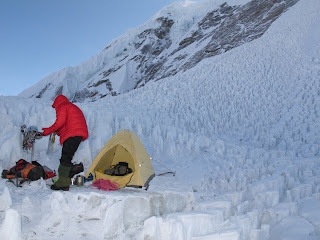 We did manage to perch our little tent on the only even patch of ice we could find and settled in for the night. After another night of hoar frost inside the tent, we packed and headed up the mountain. The rockwall that was the key to the rest of the ridge was about 30m high and sprinkled with powder snow, making it nearly impossible to climb. In 2006, compact snow was banked up nearly to the top and provided easy access to rest of the route. After climbing about 10m up the rock and snow, the holds disappeared and the snow became unconsolidated powder. There was little to no protection available and a fall in this location was unthinkable, especially with a 20kg pack. 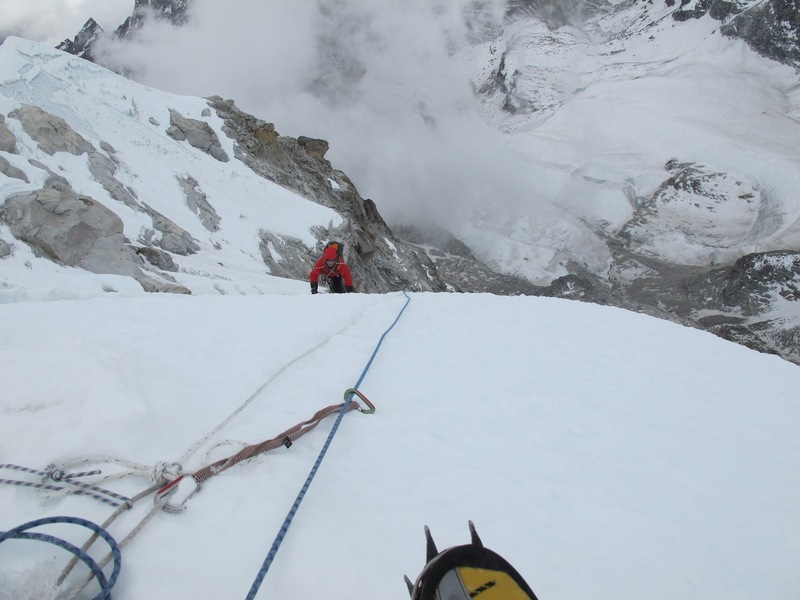 On inspection, there was an old fixed rope running over the blank rock to an anchor on the ridge. I managed to ascend the rope using prussic loops (pieces of cord wrapped around the rope) and place some pieces of protection along the way. Nevertheless, it was quite scary and exhausting. 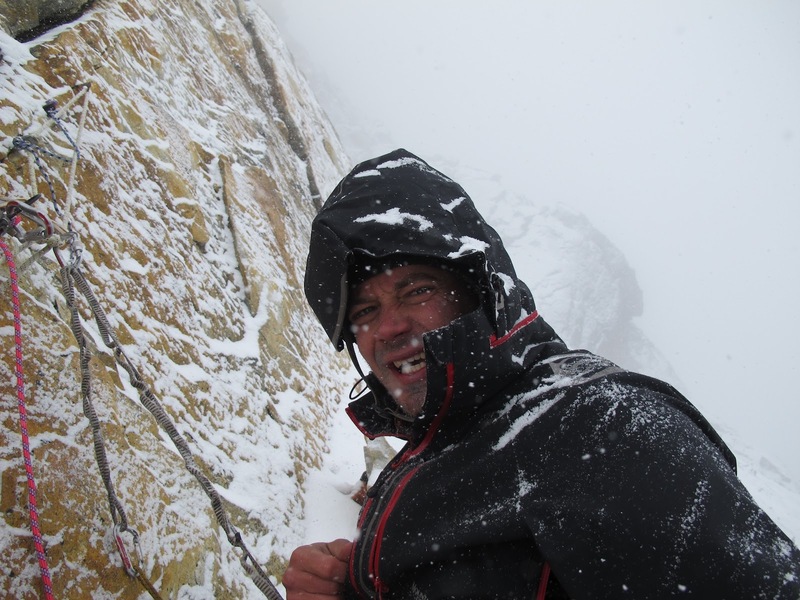 The weather was deteriorating rapidly by the time I reached the belay and was snowing heavily by the time Tim reached me. It was 930am by this stage and we were in the beginnings of a full-blown storm. Neither of us could argue that we weren’t tired from the last few weeks of exertion. It had been tough operating on minimal food and carrying heavy loads but we weren’t ready to give up. Both of us hated the thought of failure after so much effort but the weather had other ideas. The storm was getting worse and the slopes leading to the col were loading up fast. It was time to go down. Retreating from a climb is possibly one of the most depressing moments of mountaineering. All the effort and planning seemingly for nothing, but the disappointment fades and the good memories remain. The freedom, the struggle, the fight for upward movement, the motivation and the time spent with good mates are the real reason we venture into these places. Summits are a bonus and one out of two isn’t too bad. 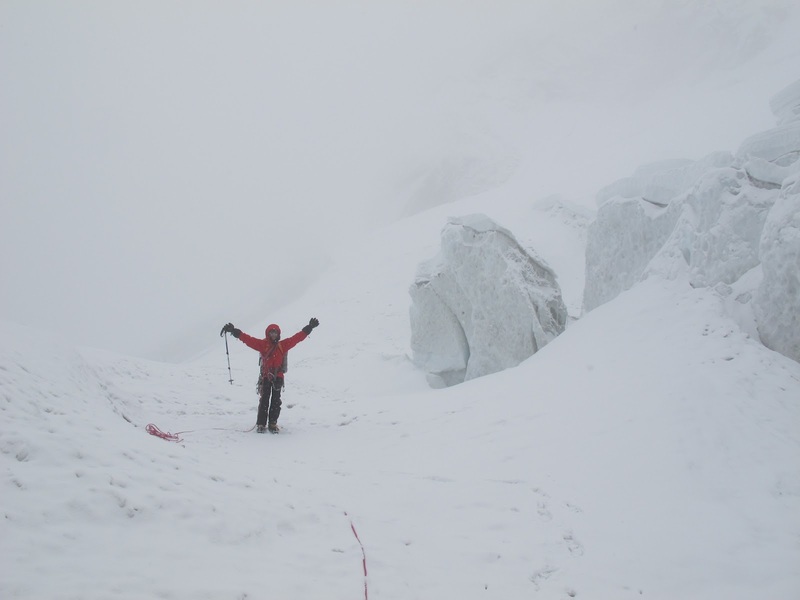 We made our way back to the col and began our descent down the glacier in a complete whiteout, following my instincts and the odd barely visible footprints to find our way off the glacier. After a long day with heavy packs, we arrived back at Machermo around 7pm, tired and disappointed, but happy to be finished. We didn’t have enough time left for another attempt so we decided to walk out and return to Kathmandu in the hope of an earlier flight home. On the walk out, we encountered the throng of trekkers and climbers making their way to Everest base camp to either climb or just visit the base camp. It seemed a great contrast to the experience that Tim and I had both shared. On both mountains, we climbed entirely alone without seeing anyone else. 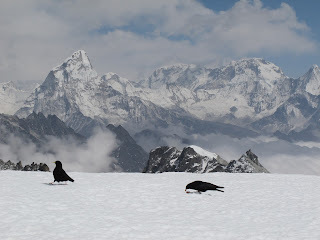 It is a huge privilege to have the mountains to oneself away from the maddening crowds. All it takes is the decision to step away from the norm and step up to a new challenge. Tim and I both had responsibilities back home that we now needed to focus on again. With a shower and clean set of clothes, we felt like new men but we had both lost a lot of weight. I had lost about 7kg and Tim looked a bit like a famine victim. 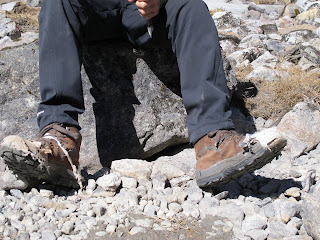 I struggled to see him if he turned side on so he began a beer diet on reaching Kathmandu to rectify the damage. My body decided to lose some more weigh with a bout of food poisoning before I jumped on the plane home- all part of the third world fun. I returned home tired and happy, excited about a new job and ready for some recovery time. The body was in a state of fatigue but recovers quickly with rest and a return to training. Life continues on with another rich experience added to the mix. 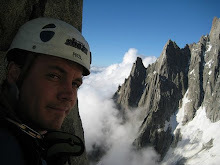 I like climbing, surfing and big adventures in wild places. Im inspired by beautiful savage mountains and the challenges they present.